I love the cool colors you used and the eye of the bird expresses so much personality. Amazing to me how you did this with just a few strokes. Thanks, Claudia. I have to give credit to the Neocolors for that. If there were a fire and I had to save one art supply, that would be it! Most everything I make during the week at this time of year has to be really quick, and Neos do this like nothing else! They really do seem to have some magic to them and you are bringing it out, I think! Thanks, Claudia. If I can do it, so can anyone else! Glad you like it! Kathy, great lines on this bird! I think Donna’s water birds are calling my name lately. I bet your daughter would love the Neocolor crayons! As would you! Hehe. Thanks, Teresa! I had fun with it. Love the immediacy of the Neos! awww thanks! I think he is! He’s at the beach, after all. I’d be smiling too! Glad you like! Great colors on that bird and I think you got the beak just right. Thanks, Laura. I enjoyed this one. I love that feeling of experiencing the beach vicariously, by hook or by crook! I’m so glad you enjoyed it, Donna! It was just fast and furious after work, but I enjoyed making it, and hopefully some of that joy comes over to the viewer. I really appreciate you sharing your talent with us and so glad I could do some small thing to return the favor. ❤ Glad you're back home again – at least you brought the warmth back with you, huh? Ooo and Ahhhhh, I love the gorgeous color and beautiful strokes Laura. The Neo’s are your friend!!! This is wonderful 🐦I love herons. Thanks, Catherine! I am really drawn to water birds these days….wishing I were at the beach lol! 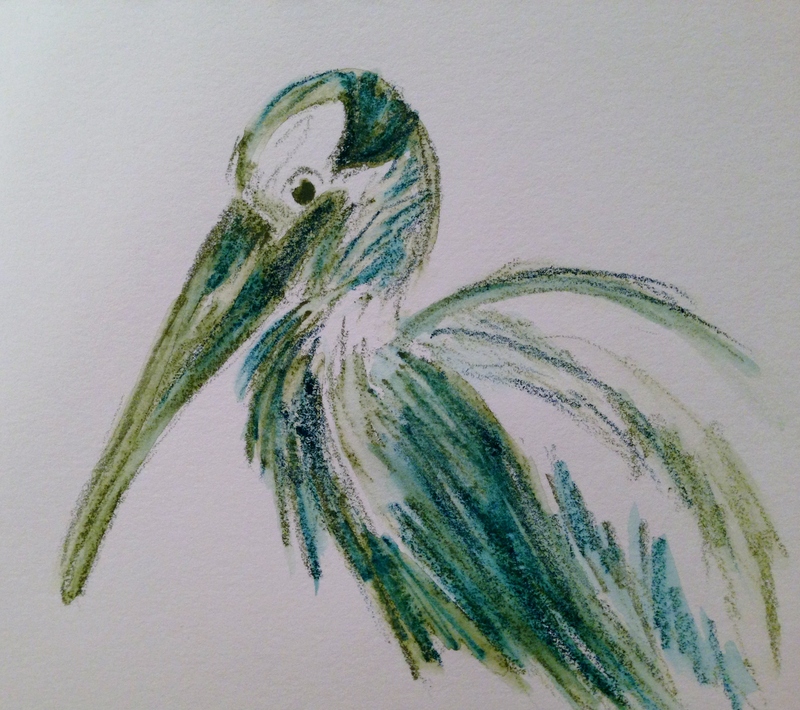 I’m really into the loose, sketchy quality in your stork! Thanks, SF! So glad you enjoyed him! So cute!! He looks a bit bashful to me – slightly bewildered that you are doing him the honour of a portrait… He totally deserves one though, and you did brilliantly! lol thanks Iris! He does look a bit surprised hehe. Thanks so much, Susan! I’ve had over half a year to play with them, and just keep being drawn back to them again and again. Really love them! Glad you enjoyed this! I should be getting mine soon. Yay!! Thanks, Jill! I’m glad you’re back home, and I hope you had a blast! Thanks, Kerfe! This one was lots of fun. Sometimes the quick ones are better than the ones we fuss over. At least for me. Neos to the rescue! Looks great. Love the green. Thanks, Teri! It was fun to try and capture him with those Neos! You use a few minutes very well :-). Thanks, Myriam. Sometimes it really helps to have a time constraint. I still think I fussed too much with this, but I liked the immediacy of it. Glad you like it also! This is so beautiful Laura, I really admire your work. Karen, you’re so kind. Thank you! I love those Neocolors! Do you use them in your quilting? I understand they are colorfast when heat set. Thanks, it was fun! Glad you like!